Who doesn’t want to be charismatic like James Bond, Bill Clinton, and Oprah? It’s not all about how physically attractive you are. It’s not about whether or not you were born with these traits. It’s about understanding human psychology. Psychology? They teach that in school! Just not the kind that breeds charisma. 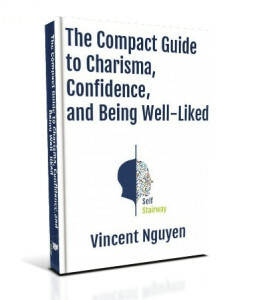 First, I go over common misconceptions associated with charisma and confidence. We dispel these myths and start looking at what’s possible. Usually people feel trapped because they’re convinced you’re either born with or without these traits. Anyone can learn how to carry themselves well with the right guidance. Second, we take a look at actual examples of individuals with these positive traits that we want. We learn a bit of psychology and how it affects others’ perceptions of us. We learn what it looks like. You probably have a pretty good idea in your head already but let’s refine it. Third, we review an exclusive case study that will teach you a lot about how social interactions work. Plus, I set a challenge for you to take to get you used to talking to people. It won’t be easy, but it will be worth it. Fourth, I give you some quick tips for confidence boosts. These are more short-term, but they get the job done. Some are fun and a few may even be used in the long-run. Fifth, we finally learn how to master long-term confidence and charisma. Looooong-term. For life. Yo. No fluff. No sleazy marketing where I’m trying to get you to buy something. Everything’s free and in this eBook. Best part? You won’t even need to give me an email address for it. It’s yours just below. Mobile Users: You might need to install Adobe Reader (Android) or iBooks (iOS) to open and read my eBook. Desktops and laptops should be good to go by default. Enjoy!